Preheat your smoker to 225 degrees F for indirect smoking. This meatloaf is awesome with hickory or oak wood. 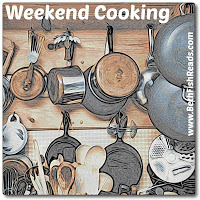 In a large mixing bowl, combine the ground beef, bread crumbs, red onion, garlic, eggs, Worcestershire sauce, Jack Daniels, and milk. Mix gently with your hands until just combined. Don’t overwork the meat or your meatloaf will be tough and chewy, just gently mix. Spread half of your meatloaf mixture on the bottom of a grill basket. Layer on the pepper jack cheese, leaving about an inch of meatloaf on all sides. Top with the remaining meatloaf mixture and press the edges together to seal completely. Any exposed holes and the cheese will leak out while cooking. In a small bowl. combine the ingredients for the sauce and then pour over the top of the meatloaf, letting it run down the sides a little bit. 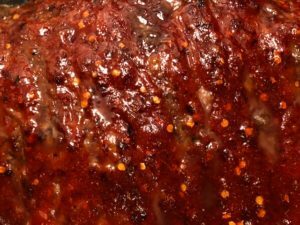 Place the meatloaf on the smoker, close the lid, and smoke for 4 hours or until the internal temperature reads 165 degrees F.
Let the meatloaf rest for a few minutes before slicing and serving. My son found this recipe and said he wanted to try it. I was skeptical because he does NOT like hamburgers or anything with cheese melted inside, or spicy food. I didn’t follow the recipe 100%. I used less garlic and baked it (350° for an hour) instead of smoking it. I couldn’t find ground corriander so I had to buy the seeds and crush them myself. And since I don’t drink I got the whiskey from my daughter & grandson who love JD. The meatloaf turned out really good. I thought it was really spicy but my son loved it. He also didn’t mind the cheese melted inside, so it was a big hit. Since there are only two of us I think if I make it again I’ll half the recipe. If you like meatloaf and wouldn’t mind it a bit spicy, you should try this. Thank you for sharing this recipe. The whiskey probably adds a lot of flavor! Amazing that the cheese didn’t leak out! Quite an ambitious meat loaf — though that would be a bigger deal in a smoker than in the oven. It’s great that your son liked the dish as it sounds like a lot of work. Actually it was really easy and didn’t take much time at all. I was surprised! And I made sure to piress the meatloaf all the way around so it the cheese stayed inside. Vicki, since you baked it (as I would) rather than smoking, did you still cook the meatloaf in a grill basket? I want to make it, but wondered about that. No, I used a 13X9 inch glass baking pan. When it was done I sat it on the counter to cool with one side tilted so the grease could drain to one end. It worked great, not at all greasy. I do plan on buying a meatloaf pan though since I couldn’t find mine. I bet Carl wold love this. He uses leftover meatloaf to make sandwiches. We do to, they are yummy! The recipe sounds good-minus the ketchup. For me ketchup belongs on two things only fries and burgers. I do like spicy!!! Ooooh, this sounds delicious. I love spicy and (like Kathy’s husband), my husband loves cold meatloaf sandwiches for lunch. It was really good so I’ll be making it again. It looks yummy. I wouldn’t mind spicy. Oh this looks yummy! I love spicy and the cheese inside sounds delicious. 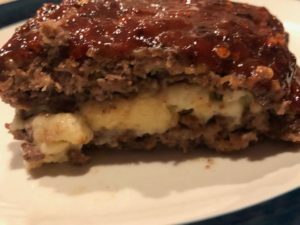 This looks more of a summery meatloaf from my usual and I definitely want to give this one a try. That’s a winning combo of ingredients! I like it. If you try it, let me know how you liked it. It looks and sounds very flavorful! It was and I’ll be making it again.